Does your Lenovo ThinkPad Laptop take longer to do the simplest tasks than before? Does it frequently freeze or tragically crash? Does it take a long time to start up? Lenovo ThinkPad Laptop is known as its stable performance and reliable confidentiality. Still, it’s inevitably that your PC will get slow and stuck over time as the most of electronic products. There are many reasons that a computer can be slow. It could be riddle with malware, system errors and excessive junk files, insufficient storage, too many startups programs and active items. Do you still think it is just slow and sluggish? Absolutely not! Click Download button to download Tenorshare Windows Care Genius to take a free PC health check and speed up your slow Lenovo ThinkPad Laptop drastically. It is a professional optimizer released by Tenorshare Inc, offering 22 features to help Windows users fix all kinds of existing problems on your computer, thereby you can easily fix system issues and boost and optimize performance the best on Lenovo/Dell/HP/Samsung. Before you decide to increase performance for your sluggish Lenovo ThinkPad X250/X220/E450/E550/P50/P70 and so on, please make sure you have downloaded and installed Tenorshare Windows Care Genius on your computer. Then you can do as the following steps. Step1. Launch the program and click Checkup in the interface. Then your computer will be automatically detected and graded ranging from 10 - 0 based on its health status. Step2. The score is displayed after scanning and you can know your PC’s situation clearly. Click Fix to fix all existing problems that may slow down your ThinkPad. Then you also are allowed to click Checkup again to its health status again. Step3. Turn on Cleanup your computer regularly on the bottom of the interface. It is designed to regularly diagnose and boost performance for your slow Lenovo ThinkPad in the background, which will be highly time-saving. In addition, Windows Care Genius can do more than that. 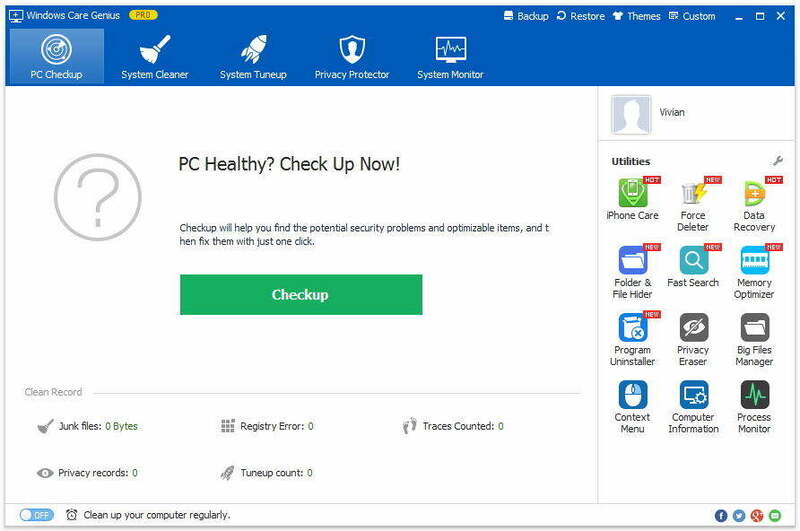 It is equipped with powerful System Cleaner and System Tuneup, letting you clean invalid registry entries, system junk files, downloaded records and shut down seldom-used startup to accelerate your slow computer. If you have any problem, you are welcomed to leave it under the comment section.